Published: 22ns March 2014M, Sa / 20 Jamadilawal 1435H, Sab. ... to Ubuntu 13.10 Saucy Salamander. Pic 1 - Finally! Ubuntu 13.10 Saucy Salamander on my laptop. I've been stagnating at 12.04 because of my thesis. I didn't need the extra hassle (e.g., customizing, adapting, etc) that comes after upgrading. But maybe i should've waited for Ubuntu 14.04 LTS Trusty Tahr? 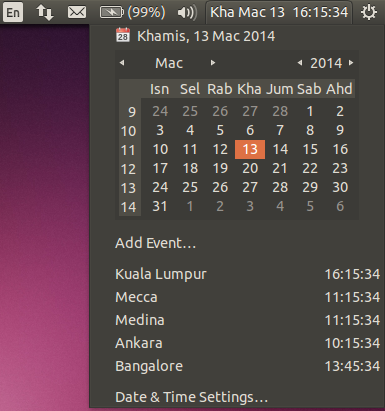 "Trusty Tahr" is the code name for Ubuntu 14.04, scheduled for release 17 April 2014. At first i upgraded, see Pic 2. Yes, i did do a backup of my things before upgrading. This computer currently has Windows 7 and Ubuntu 12.04.4 LTS on it. What would you like to do? Documents, music, and other personal files will be kept. Installed software will be kept where possible. System-wide settings will be cleared. 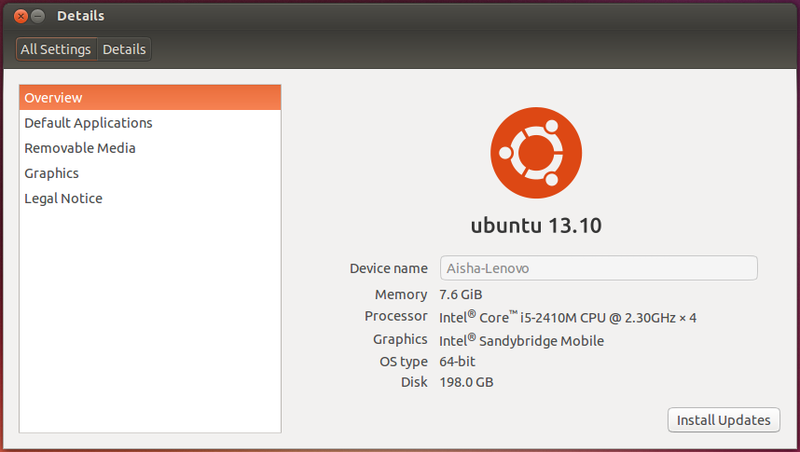 Pic 2 - Upgrade Ubuntu 12.04.4 LTS to Ubuntu 13.10. But after somethings i'm unsatisfied with (e.g., lagging, having to reinstall apps, etc), i chose to re-do the upgrade by doing a wipe and reinstall. I maintained the hard-disk space setting; carried-over from the 12.04 setup. Warning: This will delete all your Ubuntu 12.04.4 LTS programs, documents, photos, music, and any other files. * Contains pics similar to Pic 2. ⬤ Unlock from Launcher the apps i don't often use, see Pic 3. Right-click the icon, then left-click the Unlock from Launcher option. Pic 3 - Unlock from Launcher. This screenshot is just an example; i keep Software Updater locked to the Launcher. ⬤ Set the time, day, and date in the Panel, see Pic 6. 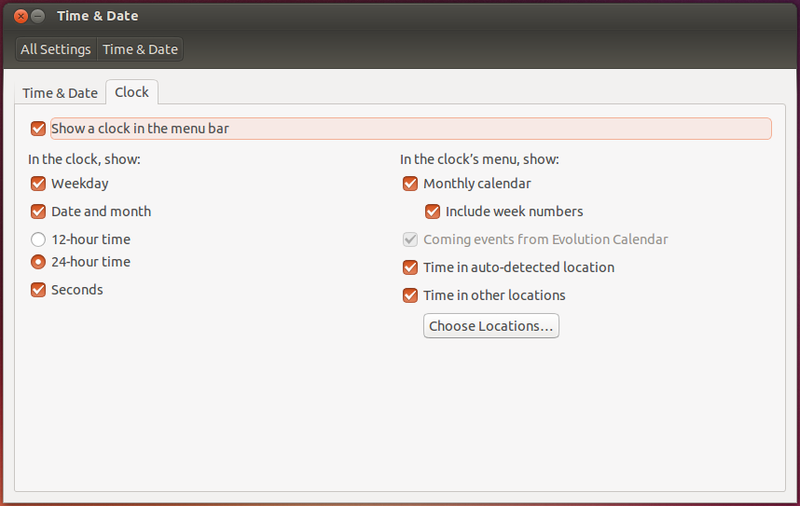 In the System Settings window in Pic 4, click the Time & Date icon, which will bring us to the Time & Date window. In the Time & Date window, click the Clock tab, see Pic 5. Adjust to suit your needs. See Pic 6 for my current setup of the Time & Date indicator in the Panel (menu bar). Pic 4 - System Settings window. Pic 5 - The Time & Date window > Clock tab. Setting the time and date. Pic 6 - My current time and date display. ⬤ Why do my screenshots include the Unknown Display? See Pic 7. By now i've managed to turn off the Unknown Display, leaving only the Built-in Display. See Pic 9. 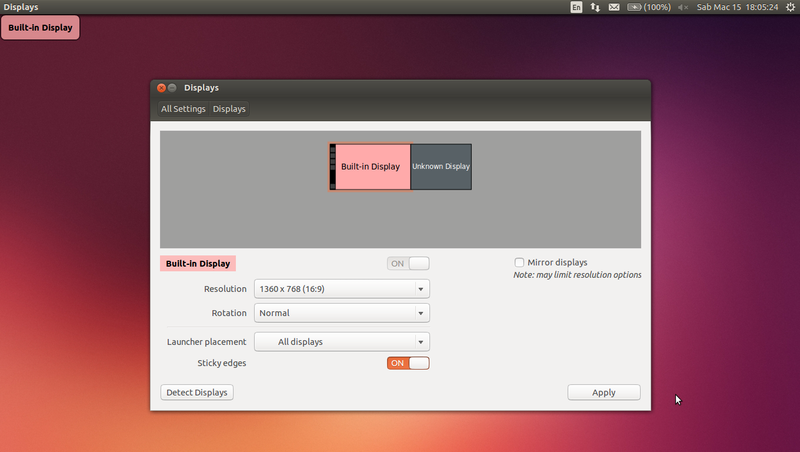 In the System Settings window in Pic 4, click the Displays icon, which will bring us to the Displays window in Pic 7. In the Displays window, click the Unknown Display. Click the slider button to change from ON to OFF. Then click the Apply button. An untitled dialog box will appear, see Pic 8. In the dialog box, click the Keep This Configuration button. The display will be reset to its previous configuration in ... seconds. Pic 7 - Screenshot showing the Built-in Display and Unknown Display. Pic 8 - Untitled dialog box. Pic 9 - Only the Built-in Display is captured in the screenshot. ⬤ Set the Launcher to auto-hide. In the System Settings window in Pic 4, click the Appearance icon, which will bring us to the Appearance window. In the Appearance window, click the Behavior tab, see Pic 10. To auto-hide the Launcher, click the slider button to change from OFF to ON. ... of the Launcher to suit you. Pic 11 - The Workspace Switcher icon in the Launcher. Pic 12 - The Show Desktop icon in the Launcher. ⬤ Increased the pointer speed, see Pic 13. In the System Settings window in Pic 4, click the Mouse & Touchpad icon, which will bring us to the Mouse & Touchpad window in Pic 13. Adjust accordingly to suit you. Pic 13 - The Mouse & Touchpad window. ⬤ Note: Keep this app. Don't uninstall it. See Pic 14. 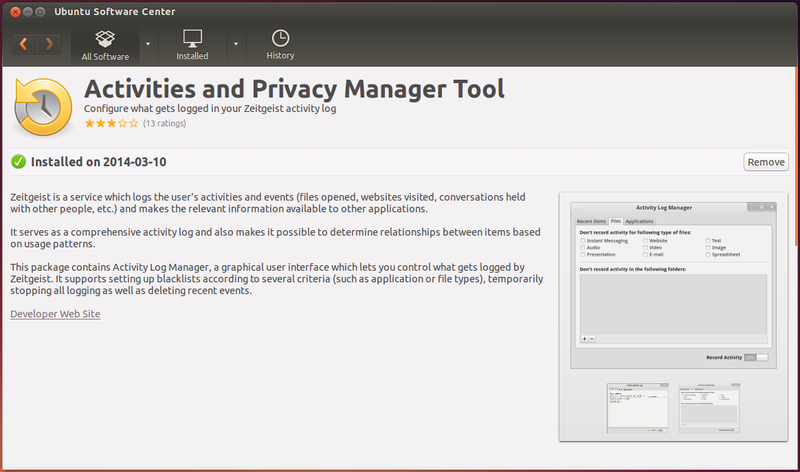 Pic 14 - Description of the Activities and Privacy Manager Tool in Ubuntu Software Center. (i) In the System Settings window in Pic 4, click the Security & Privacy icon, which will bring us to the Security & Privacy window. In the Security & Privacy window, click the Search tab, see Pic 15. To not include online search results when searching in the Dash, click the slider button to change from ON to OFF. Pic 15 - Security & Privacy > Search. (ii) Do read the legal notice about searching in the Dash, see Pic 16. In the System Settings window in Pic 4, click the Details icon, which will bring us to the Details window. In the Details window, click the Legal Notice tab, see Pic 16. You may restrict your dash so that we don’t send searches to third parties and you don't receive online search results. To do this go to the Privacy panel and toggle the ‘Include online search results’ option to off. The Privacy panel can be found in your System Settings or via a dash search. For a current list of our selected third parties, please see www.ubuntu.com/privacypolicy/thirdparties. Although most changes are likely to be minor, Canonical may change this legal notice from time to time, and at Canonical's sole discretion. Please check this page from time to time for any changes to this legal notice as we will not be able to notify you directly. Pic 16 - Legal notice about searching in the Dash. In the System Settings window in Pic 4, click the Security & Privacy icon, which will bring us to the Security & Privacy window. To stop the Record file and application usage, click the slider button to change from ON to OFF. Uncheck the boxes listed under Include:. To clear records, click the Clear Usage Data... button. In the Clear Usage Data window, see Pic 18, select the time range then click the OK button. In the untitled dialog box, click the Yes button, see Pic 19. Pic 17 - Security & Privacy > Files & Application tab. Pic 18 - Clear Usage Data window. Pic 19 - Untitled dialog box. 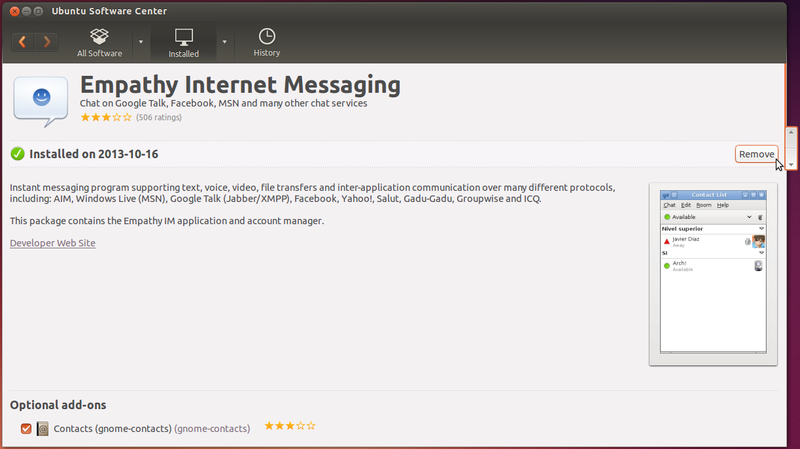 Pic 20 - Description of Empathy Internet Messaging in Ubuntu Software Center. (i) Click the Remove button. See Pic 20. (ii) In the untitled dialog box, click the Remove All button. See Pic 21. (iii) In the Authenticate dialog box, fill-in your password in the Password: field, then click the Authenticate button. See Pic 22. Pic 21 - Untitled dialog box. Pic 22 - Authenticate dialog box. 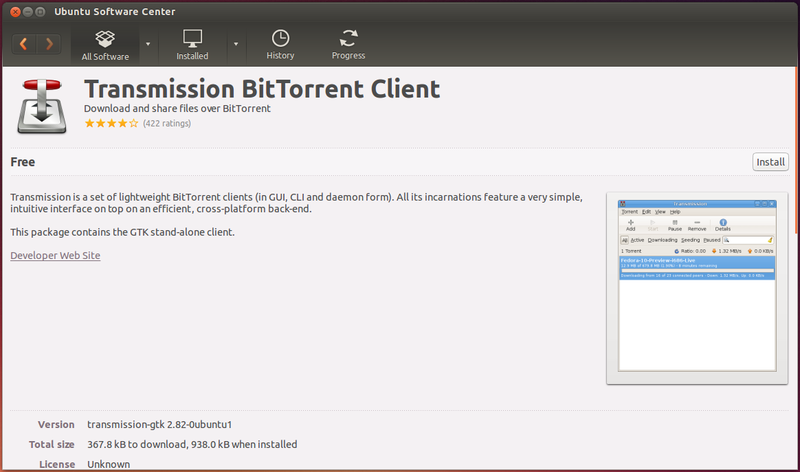 Pic 23 - Description of the Transmission BitTorrent Client in Ubuntu Software Center. 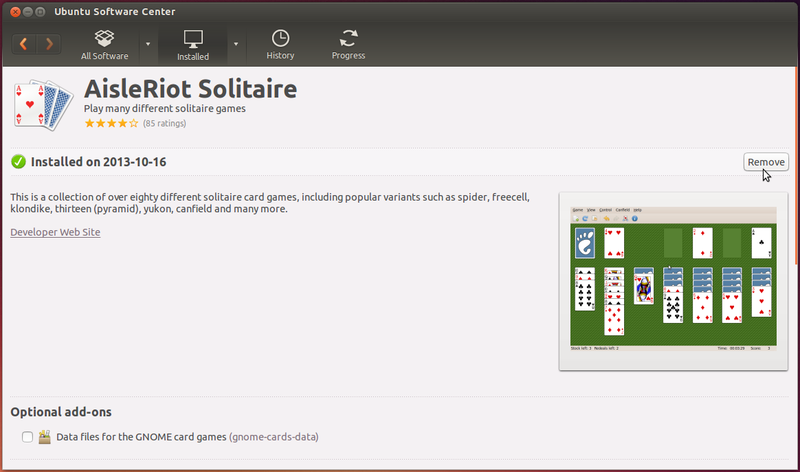 Pic 24 - Description of the AisleRiot Solitaire app in Ubuntu Software Center. 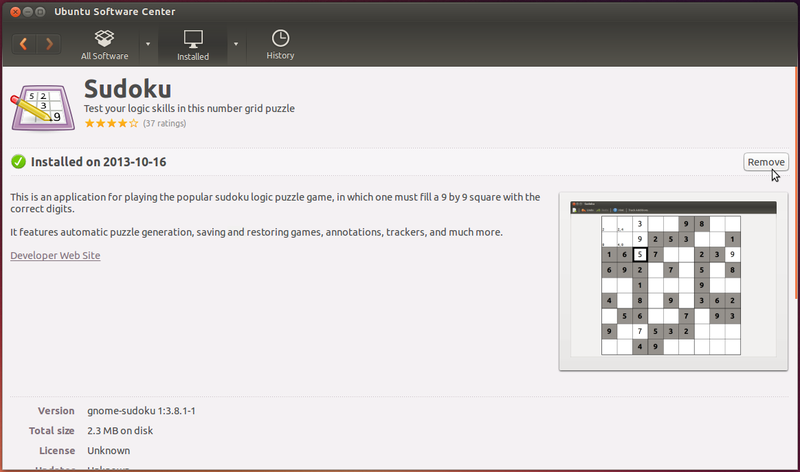 Pic 25 - Description of the Sudoku app in Ubuntu Software Center. 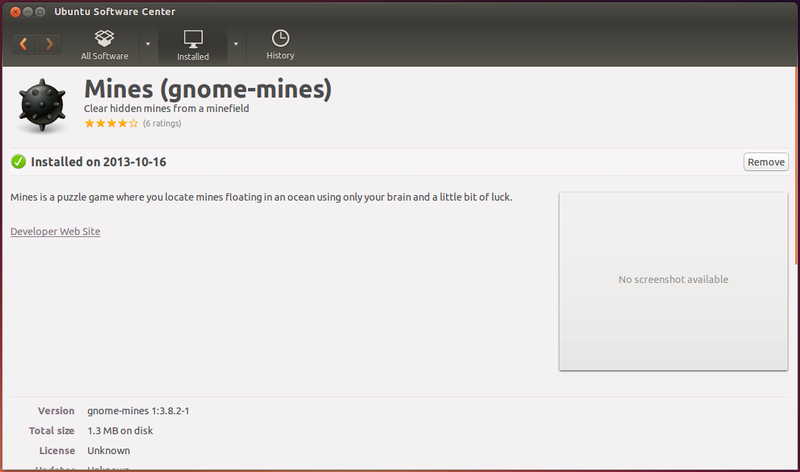 Pic 26 - Description of the Mines (gnome-mines) app in Ubuntu Software Center. 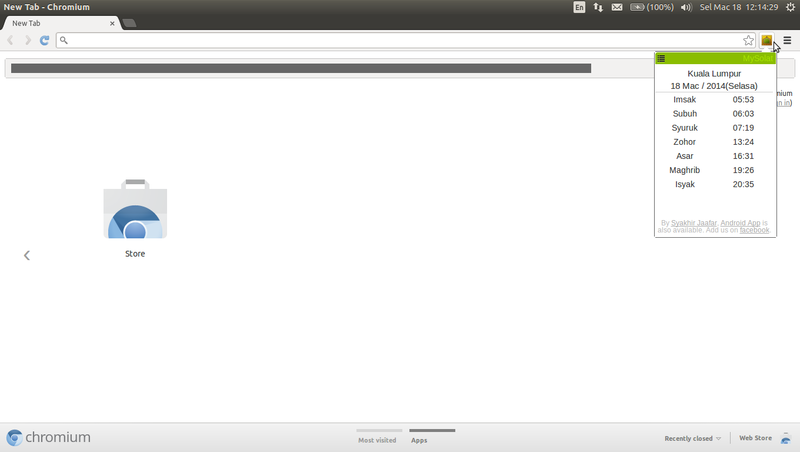 Pic 27 - Description of the Mahjongg app in Ubuntu Software Center. 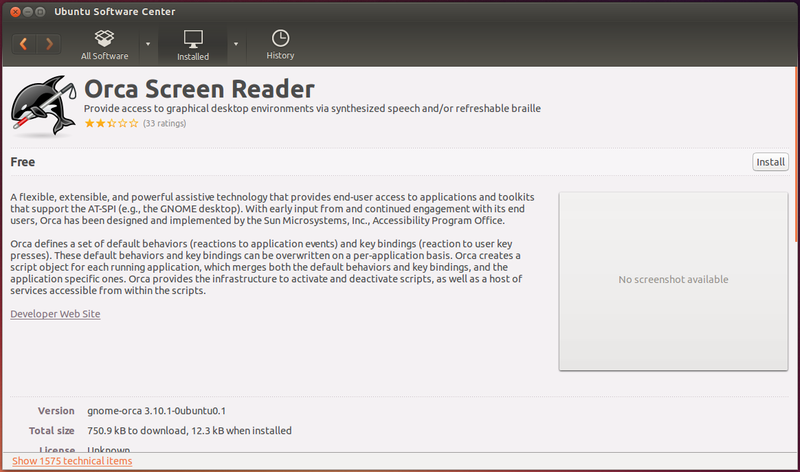 Pic 28 - Description of the Orca Screen Reader app in Ubuntu Software Center. 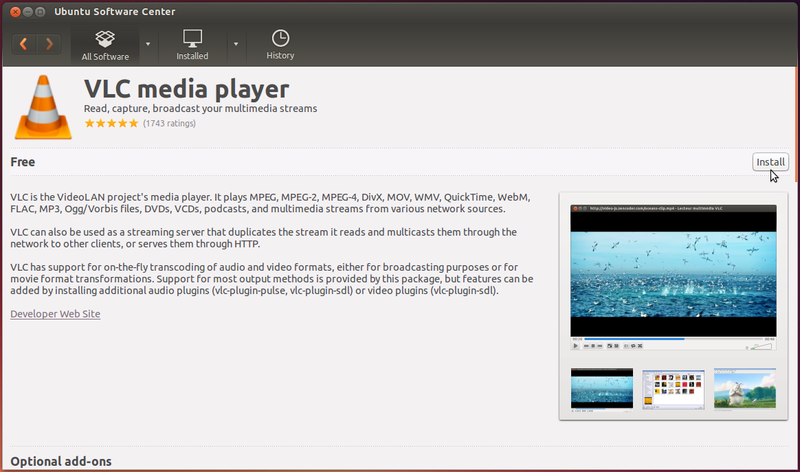 Pic 29 - Description of the VLC media player in Ubuntu Software Center. (i) Click the Install button. See Pic 29. (ii) In the Authenticate dialog box, fill-in your password in the Password: field, then click the Authenticate button. See Pic 22. 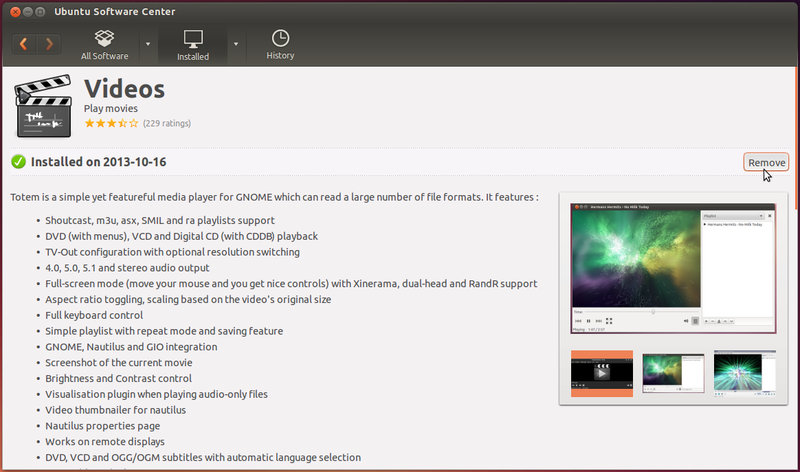 Pic 30 - Description of the Videos app in Ubuntu Software Center. ⬤ What happened to LibreOffice Draw? See Pic 31. -- Oh, it's listed under Graphics, see Pic 32. I didn't notice that earlier. 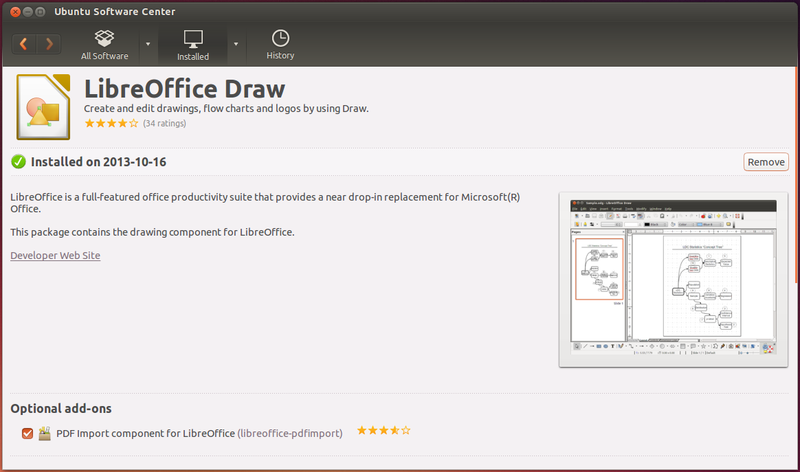 Pic 31 - Description of LibreOffice Draw in Ubuntu Software Center. 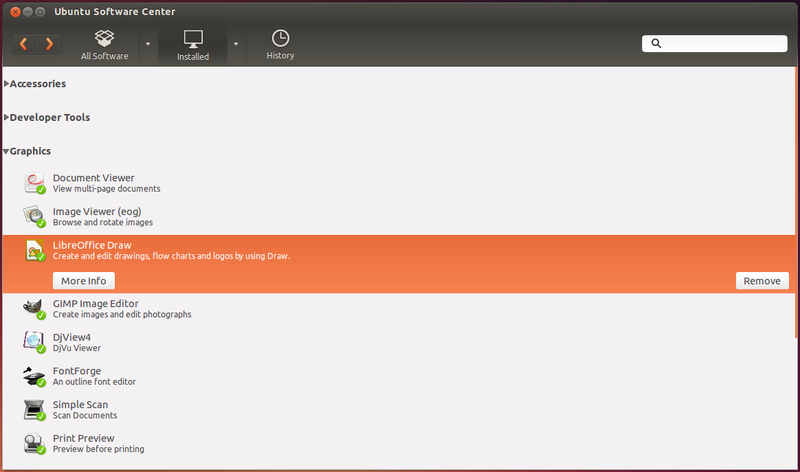 Pic 32 - The LibreOffice Draw is listed under Graphics in Ubuntu Software Center. 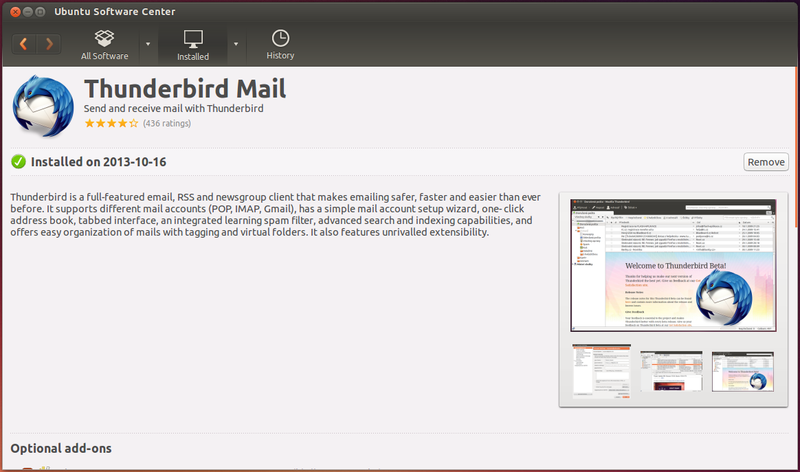 Pic 33 - Description of the Thunderbird Mail in Ubuntu Software Center. ⬤ Uninstalled, see Pic 34. 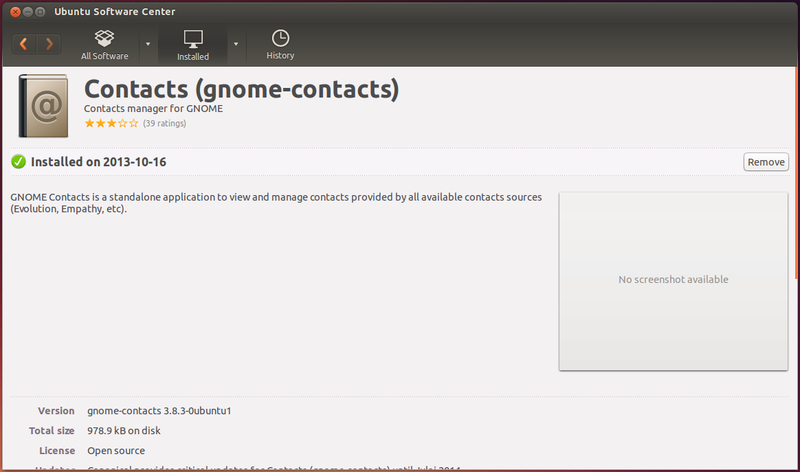 Pic 34 - Description of the Contacts (gnome-contacts) app in Ubuntu Software Center. Pic 35 - Description of the Shotwell Photo Manager in Ubuntu Software Center. 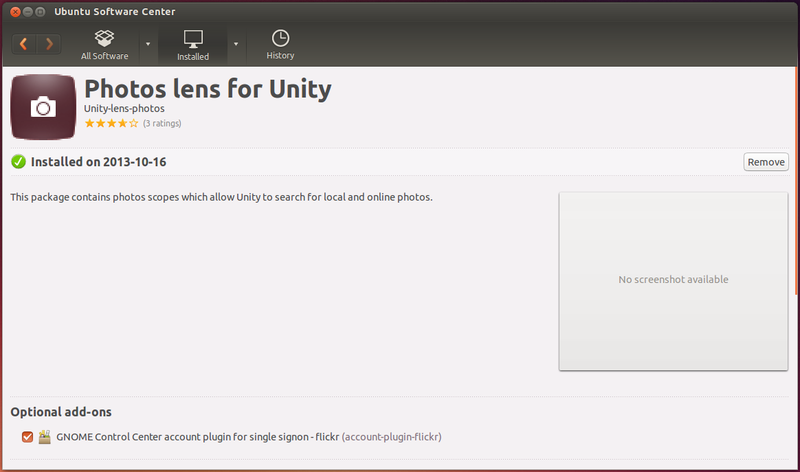 Pic 36 - Description of the Photos lens for Unity app in Ubuntu Software Center. 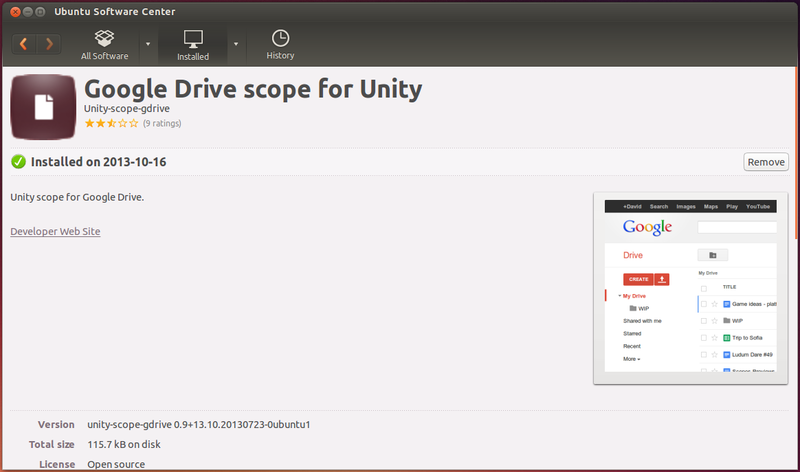 Pic 37 - Description of the Google Drive scope for Unity app in Ubuntu Software Center. Pic 38 - Description of the Landscape Service in Ubuntu Software Center. 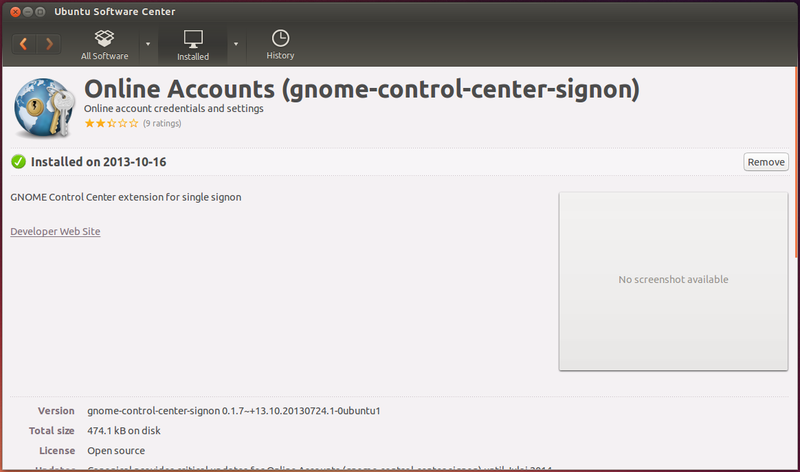 Pic 39 - Description of the Online Accounts (gnome-control-center-signon) app in Ubuntu Software Center. 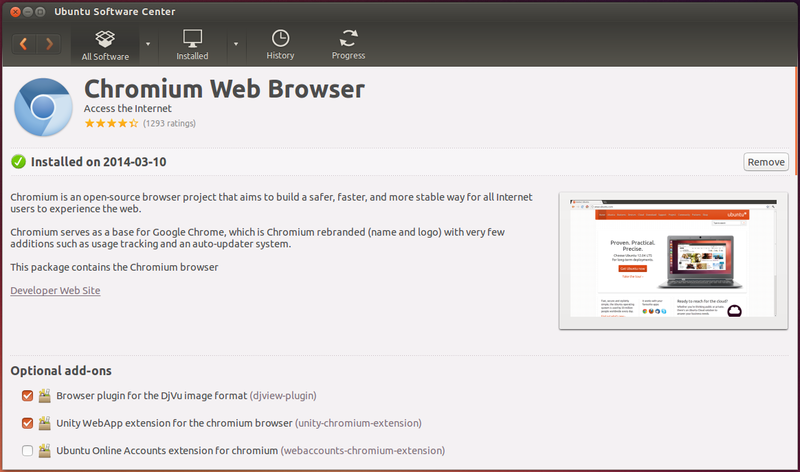 Pic 40 - Description of the Chromium Web Browser in Ubuntu Software Center. Although it was last updated in 2012, it still works as of 18th March 2014. See Pic 42. 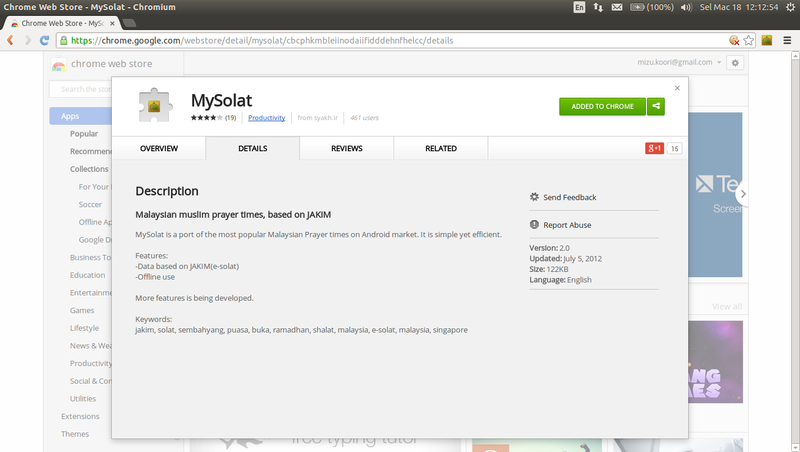 Pic 41 - MySolat app in Chrome Web Store. Pic 42 - MySolat app working in my Chromium browser. 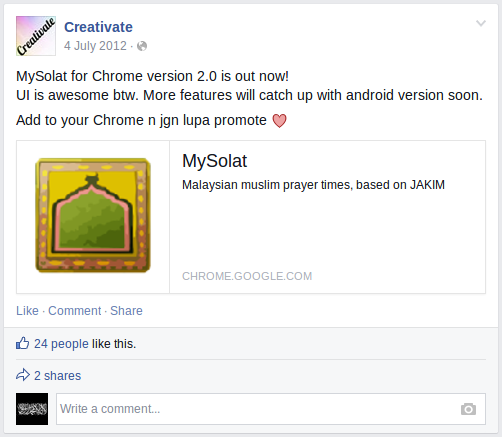 Pic 43 - Facebook post by the developer of MySolat. ⬤ Adjusted the screen's brightness, see Pic 44. In the System Settings window in Pic 4, click the Brightness & Lock icon, which will bring us to the Brightness & Lock window in Pic 44. Adjust to suit you. Pic 44 - The Brightness & Lock window. ⬤ Turn-off the internal microphone, see Pic 45. In the System Settings window in Pic 4, click the Sound icon, which will bring us to the Sound window in Pic 45. In the Sound window, click the Input tab. Under the Settings for Internal Microphone, for the Input volume, click the slider button to change from ON to OFF. Pic 45 - The Sound window. 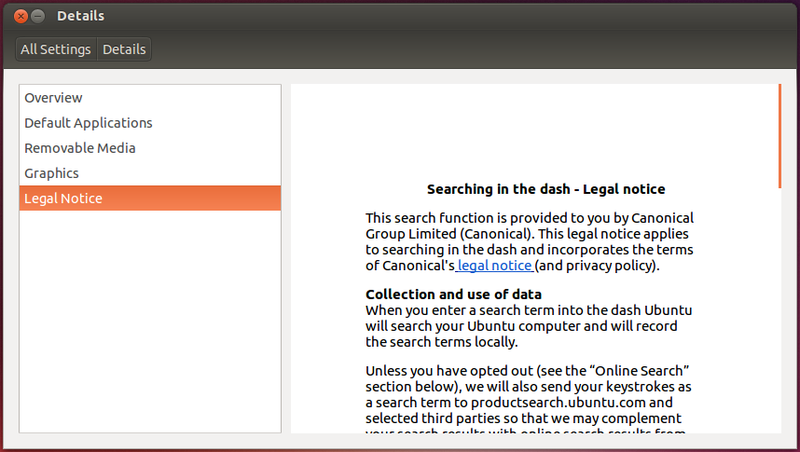 Pic 46 - Description of the Adobe Flash plugin in Ubuntu Software Center. ⬤ Adjusted browser cookies settings. 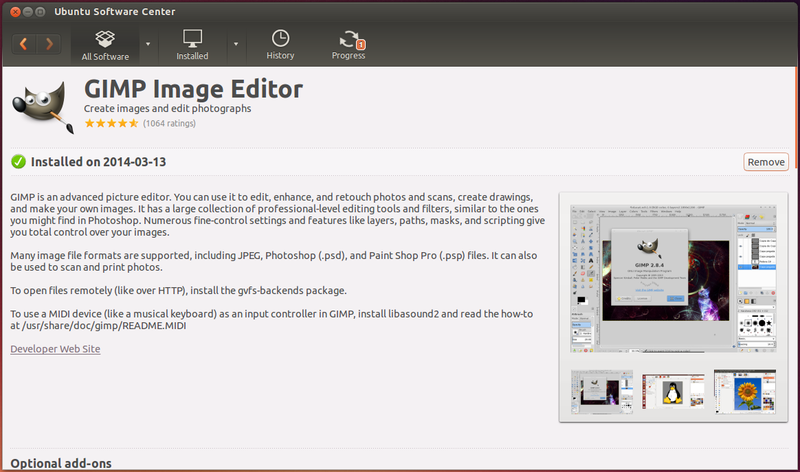 Pic 47 - Description of the GIMP Image Editor in Ubuntu Software Center. 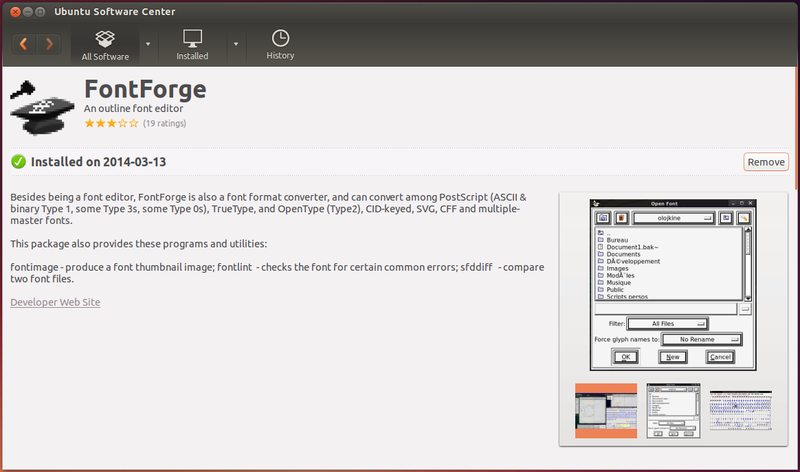 Pic 48 - Description of FontForge in Ubuntu Software Center. 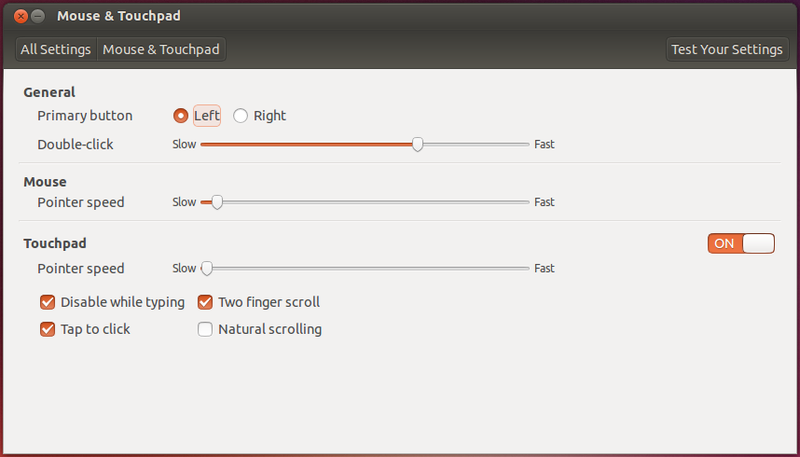 Pic 49 - Description of the Nautilus plugin for opening terminals in arbitrary paths in Ubuntu Software Center. 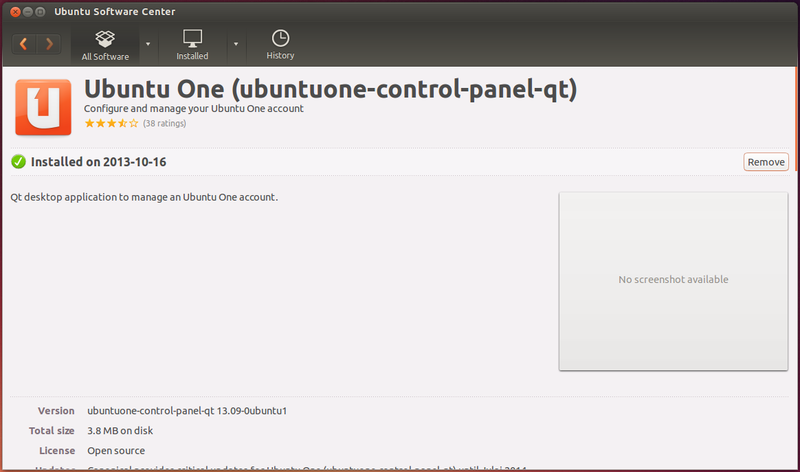 Pic 50 - Description of the Ubuntu One (ubuntuone-control-panel-qt) app in Ubuntu Software Center. ... so that i could make the cloud icon in the Panel, see Pic 51, go away. 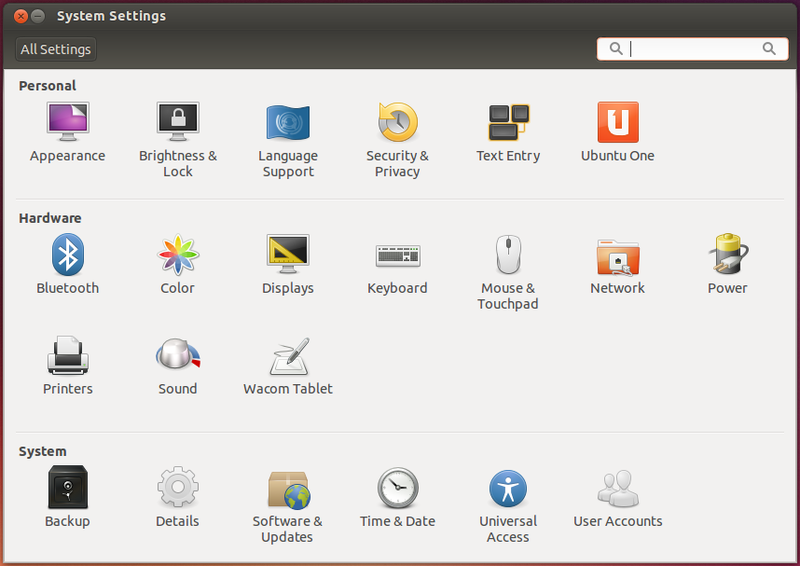 Pic 51 - The Ubuntu One cloud icon in the Panel. Pic 52 - Description of the Ubuntu One music store scope for unity app in Ubuntu Software Center. ⬤ Figure out why the cursor isn't included in screenshots when taken using the PrtSc button. ⬤ Hide envelope icon from (top) Panel.